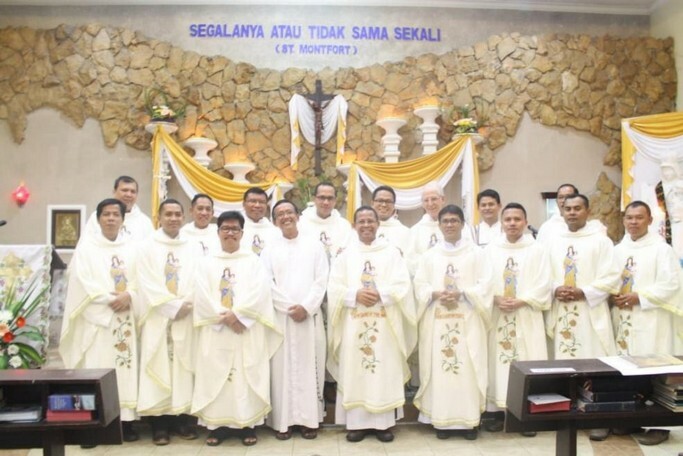 MALANG, Indonesia- We are grateful to the Lord Jesus and to His Most Beloved Mother, the Virgin Mary who guide the six Montfortians of Indonesia who celebrated 25 years of Religious Life at Montfort Seminary “Pondok Kebijaksanaan”- Malang, Est Java-Indonesia, on 15th August 2018. The six confreres who celebrated 25 years of Religious Life are: Br. Nikolaus Narimo Husodo, SMM; Fr. John Suri, SMM; Fr. Laurensius Maria Ariston, SMM; Fr. Avelinus Amput, SMM; Fr. Gatot Wibawa, SMM and Fr. Moko, SMM. All were present except Fr. Moko because he is in the mission at Papua New Guinea (PNG). It is the first time that the Montfortians in Indonesia celebrate officially silver jubilee in Religious Life. The Superior, Fr. Antonius Tensi, SMM presided the Holy Eucharist in the chapel of Montfort Seminary, together with the formators of the seminary and priests from different places. Fr. Antonius, in his homily highlighted the importance of celebrating silver jubilee in religious life. “We are celebrating 25 years of religious life for the first time here in Indonesia to emphasize the value of being a Montfortian religious. We know that normally priests want to celebrate anniversaries of 25 years, 40 years, 60 years or 75 years of priesthood, but for us being a Montfortian religious is also very essential. That’s why it must be celebrated and this celebration is done for the first time in Indonesia.” He said. At the end of the Mass, Br. Nico, SMM as primus inter pares, shared inspiring stories of their religious life as Montfortians in Indonesia and thanked the parents, confreres, relatives and friends who supported them in their formation. The celebration continued with refreshments and dinner together with the families of the jubilants, priests, brothers, sisters, seminarians and the faithful. This celebration is perceived as a moment for renewing the spirit of Religious life as Montfortians and to thank God for the gift of consecrated life and for His guidance and protection for the confreres under the maternal care of Our Mother Mary. The anniversary celebration of 25, 40, 60 or 75 years of profession in the Company of Mary (Montfort Missionaries) is for us something special and most cherished.